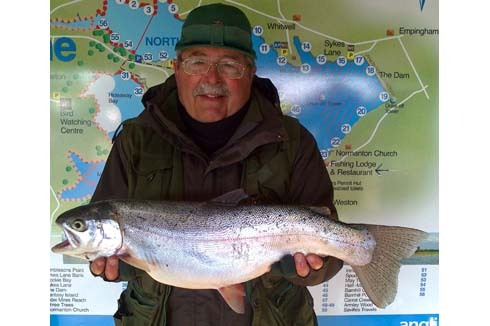 Rutland Water’s best Brown weighs in at 6lb 1½oz and the biggest Rainbow weighs 6lb. 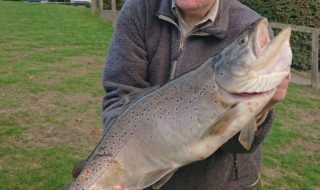 The best fish of the week was a Brown falling to boat angler Albert Tipple who recorded a fine 6lb 1½oz specimen last Sunday. Albert, who travelled down to Rutland Water from the North East, fished a humungus on a midge tip. The best Rainbow weighed in at exactly 6lb and was caught by season ticket holder Lyn Walters of Oakham. This fish fell to a minkie on a fast glass line near the Sailing Club. The recent cooler weather has steadied sport down a little with some rain and variable strong winds making things more challenging. Fish are still coming out of many areas of the reservoir for both bank and boat anglers. A mixture of dries, fry patterns and nymphs are accounting for most fish, with fry, corixa and snails showing in stomach contents. There were also a lot of fish prepared to follow the fly on some days so all of this combined to provide some exciting, but often frustrating sport. Brown trout are showing in many areas of the reservoir with some boats catching over half a dozen, please remember that anglers are only allowed one brown each per bag limit. The Brown trout season ends on 29 October. Bank anglers have had good sport with fish feeding very close into the shoreline with dries and fry patterns with more fish appearing to feed on the corixa/snails and just the odd one on this year’s fry at the moment. Bristol’s Martin Cottis and a group of friends came up for three days and experienced variable weather conditions with heavy rain on Wednesday. This did not dampen their enthusiasm though with fish falling to dries and nymphs and coming from many areas including the top of the North Arm. Anglian Water Autumn Boat Pairs 11 October. Fished last Saturday with flat calm conditions giving way to variable 4/5 mph winds, boats were typically stretched out all over the reservoir with variable results. Settled weather is forecast later in the week and this will help, but in the meantime anglers will have to cope with variable winds. Bank anglers should find plenty of fish close into the shoreline, with boats searching close in along the banks. Please note all boats are booked on Sunday 19 October. Best Rainbow 6lb taken by Lyn Walters of Oakham. Best Brown 6lb 1½oz taken by Albert Tipple. Best boat areas Around the shorelines. Best bank areas New Zealand Point, Sailing Club, Normanton, Finches, Transformer, Whitwell. Best methods Bank – Dries and fry patterns. Boat – as for bank. Mid week boat winner J Phillips of Kettering. Beginners courses:25 October; 1 November. Fry Feeders Match 19 October – All boats booked. 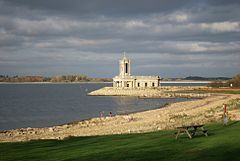 Both bank and boat anglers have enjoyed good sport at Grafham Water with a rod average of 3.6 for the past week. The best bank areas producing the most consistent catch rates have been the South and Bowl of the Dam. Plummer Bank, Mander Car Park frontage, Hill Farm and Pylon Point have also produced good fishing for anglers using floating lines with Diawl Bachs, GRHE, shrimp patterns and small damsel nymphs. Season ticket holder Kevin Donovan has had a very successful week by catching and releasing 46 trout in seven visits. Kevin has mainly fished the Plummer bank with a floating line and red holographic diawl bachs. Boat anglers have also had a great week’s sport with a number of areas producing good catch rates. Valley Creek, Gaynes Cove, G,A and Q Buoys, Bowl of Dam, Savages Creek and Sanctuary Bay. The best boat methods have been to fish floating or fast glass lines with diawl bachs, GRHE, hoppers, Black Booby and black and green tadpoles. 22 Competitors fished this event on a very blustery day with restrictions in place for safety reasons (south shore only) and managed to catch 39 trout for a rod average of 1.77. Top rod on the day was John Mees who managed to catch six trout for 13lb 15oz. John’s tactics on the day were to fish a fast glass line with a team of black boobies at A Buoy. Graham Pearson won the guests’ match with eight fish for 17lb 3oz. Graham’s successful method was to fish a fast glass line with orange blobs in Gaynes Cove. Best fish 3lb 14oz taken by Ashley Cooper. Best Brown 3lb 2oz taken by Christian Mueller of Germany. Best boat areas Valley Creek, A,G and Q Buoys, Gaynes Cove, Savages Creek, Sanctuary Bay. Best bank areas Plummer Bank, South and Bowl of Dam, Valley Creek, G Buoy, Hill Farm, Pylon Point. Mid week boat winner Ben Ward of Cottenham. Fry Feeders match 18 October. Improve your bank fishing 8 and 23 November. Grafham Water Fur and Feather (bank) 30 November. 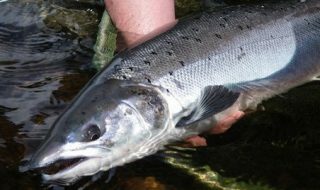 Some of the weather conditions have made fishing challenging this week and fish have remained fairly deep, but some anglers have had some good catches using Di5/Di7 lines and fry patterns. Geoff Makin managed to find some very good fish using these tactics with his very useful ‘wtf’ flies. Fishing off Rigbys Point Geoff recorded some nice Browns and Rainbows up to 4lb. Bank fishing is now beginning to improve due to the weed dying back slightly and the early morning fry feeders hanging around the weedbeds. Last Sunday Pitsford held the AMFC match. 24 Anglers in total managed to tempt a few trout on sunken lines, tubes/minkies and boobies. The rod average for this match was 1.7. Best boat areas Main Bowl, Narrows. Best bank areas Rigbys, Gravels. Mid week boat winner Mick Stevens of Kingsthorpe. Beginners courses: 18 and 26 October.